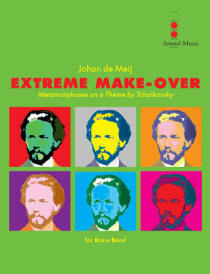 Extreme Make-over consists of a number of musical metamorphoses on a theme from Peter Ilyich Tchaikovsky’s well-known Andante cantabile (the second movement of his String Quartet No. 1 in D, Op. 11, written in 1871). “Never in my life have I felt so flattered, never have I been so proud of my creative powers as when Lev Tolstoy sat in the chair next to mine listening to my Andante, and the tears ran down his cheeks,” wrote the composer in the winter of 1876 on the occasion of a special concert organised for Tolstoy at the Moscow Conservatory. In 1888 Tchaikovsky arranged this movement for cello and orchestra. The main theme of the Andante cantabile is based on a Russian folksong. In Extreme Make-over this theme is introduced in its original form by a brass quartet consisting of two cornets, alto horn and euphonium. At the theme’s reprise, muted cornets sneak, almost inaudibly, alongside the four soloists and elongate each note of the melody, as though the sustaining pedal on a piano has been depressed. The first metamorphosis emanates from a single tone, to which the two successive tones from the theme are added in bell-like chords. The addition of the lower second results in a completely new sound world, completing the first metamorphosis. Anticipating the canonic theme from the finale, a timpani solo forms the transition to the Alla marcia. This movement is composed in a robust neo-classical style and is peppered with quotes, including fragments from Tchaikovsky’s Fourth and Sixth Symphonies and the Fantasy-Overture Romeo and Juliet. The following movement features a rather unconventional instrumental group: ten tuned bottles, played by members of the cornet section. This group eventually provides the accompaniment for an extensive marimba solo, gradually producing a sort of gamelan effect. In composing for the tuned bottles I have applied the ‘hoketus’ technique: each player produces a single note of the melody or the chord. This fragile movement is joined seamlessly to the finale, a canonic treatment of the theme. Hurtling through each instrumental group, it leads us to a festive conclusion.